subroutineTrace [X]– If successful, give the Runner 2 tags. subroutineTrace [X]– If successful, end the run. Anyone who’s played Caduceus enough can tell you full well how often an unpumped trace-2 ETR subroutine is unsuccessful if fired. Given that nowadays, many runners are packing link due to dangerous threats like Exhibit A or Exhibit B, that trace-2 ETR can end up costing the corp a lot more than they paid for. However, anyone who’s ever played Resistor can tell you how often their trace-4 ETR subroutine is successful (if not broken) and how valuable it is at a great rez cost. This is pretty good at a 5 rez cost and letting both subs fire can be expensive to pay through (Power Tap builds aside) or game-ending. There is a catch, however – Surveyor needs support from an additional piece of ICE to get X = 4. Which makes Surveyor quite difficult to play early game since it’s got a huge upfront of having an additional ICE installed + its own rez cost of 5. The immediate synergy that comes to mind is pairing this bad boy with Jinja City Grid or other installation-support cards. But what about when X > 4? • Mimic, git gud kid. Cards like Surveyor are the finale in the Kitara cycle's plan to rejuvenate the Glacier archetype (although ICE destruction being back is a thing so maybe not). 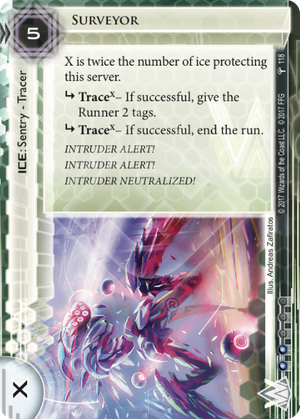 It's also an easy target to splash into other Glacier builds at its 2-influence cost. A good face-check ICE, a better taxer as soon as you can make X >= 4 but one that should not be used for more rush-based play. Just don't let Security check on Surveyor.